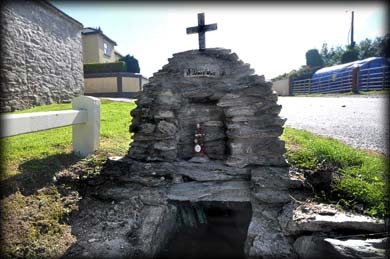 This roadside well is dedicated to St James of Compostela in northwest Spain. It is a simple D-shaped cairn with a niche that holds a statue of St James. A stone cross sits on top of the cairn. The water from the well runs down a narrow stone-lined channel that flows underground before re-emerging at a small pond in St Anne's Garden, from here it joins another stream from the nearby St Anne's Well. A pattern to the well, which took place on the 25th July discontinued in about 1820. 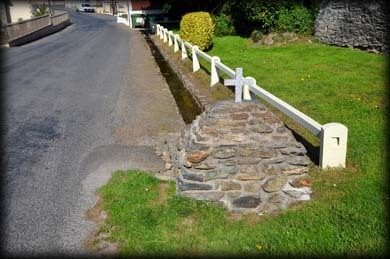 Situated: St James' Well is on the opposite side of the road from St James and St Anne's Church in the Centre of the village. Discovery Map 77: T 0288 0810. Last visit Aug 2015.